Restorative Dentistry – includes precision-crafted dental crowns and dental bridges to protect and strengthen a chipped tooth, broken tooth, cracked tooth and missing teeth and restore the beauty and health of your smile. You will enjoy a comprehensive, comfortable and pain-free experience in a climate of total understanding and trust. Cosmetic Dentistry – includes porcelain veneers, teeth whitening, cosmetic bonding and tooth-colored fillings designed to beautify your smile and improve your self-confidence. Ask us about our options for natural teeth whitening at home. Dental Implants – from the masters of smile restorations with teeth implants. We partner with leading implant specialists to ensure that your dental implants are properly placed for a lifetime of beautiful smiles. Invisalign® Teeth Straightening with clear braces – a wildly popular alternative to metal braces that uses clear aligners to move crooked teeth just like braces do. Only Invisalign can be removed to eat, brush and floss. Children’s Dentistry – for great dental health that begins with your child’s first toothless smile. 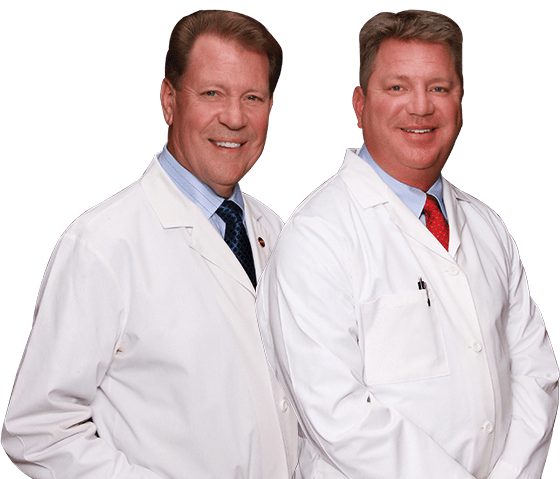 As your children grow, Dr. Ron and Dr. Jeff will carefully and continuously monitor their teeth, making room or saving space as needed to avoid the discomfort and expense of braces, when possible. Many families have kids who participate in sports, so Dr. Jeff and Dr. Ron will custom-fit an athletic mouth guard (even in your team colors), too. They also create special appliances, including occlusal guards, to reduce or eliminate snoring so your whole family can rest easier. Most people know that it’s important to maintain healthy gums. After all, your gum tissue is what nourishes your teeth and helps keep them healthy. And the number-one cause of tooth loss is gum disease. According to recent research studies, gum disease can have more dangerous and even life-threatening side effects if left untreated. Most people don’t realize that diseased gums can lead to a diseased heart and circulatory problems throughout the body, including erectile dysfunction (ED) in men. Your gums are one of your first lines of defense against these and other serious health issues. That’s why Grout Family Dentistry is all about helping you overcome periodontal disease and keeping your gums healthy. Periodontal disease often starts with inflammation of the gums. They can be red and swollen and bleed easily when you floss or brush. This inflammation is just the beginning of periodontal disease, and it can easily lead to arthritis, diabetes, heart disease and stroke. The American Academy of Periodontology estimates that three out of four Americans have some form of periodontal disease, ranging from mild gingivitis to severe periodontitis. The good news is that periodontal disease is completely avoidable – and it is quite possible to keep your teeth for life – if you care for your gums properly. Thorough flossing daily and two or more professional dental hygiene cleanings each year are sufficient for most people. Others may need more frequent professional teeth cleaning. Dr. Jeff, Dr. Ron and our dental hygiene staff will deliver gentle, extensive professional dental care to give you a beautiful, healthy smile that will last a lifetime. To schedule an appointment, please call us at 303-730-1222 or fill out our online Request an Appointment form. Our service area includes Denver County, Douglas County, Arapahoe County and neigboring locations, including Columbine, Denver, Centennial, Highlands Ranch and Littleton, CO.